Hydrogen fuel is fed into the “anode” of the fuel cell. 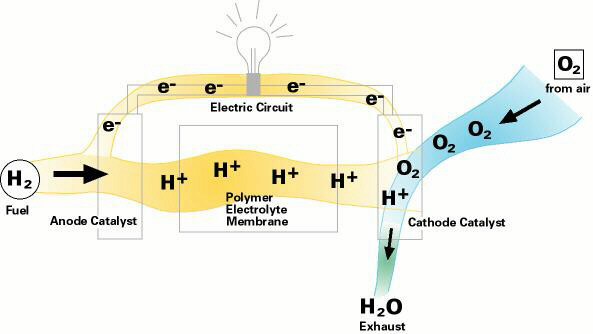 Oxygen (or air) enters the fuel cell through the cathode. Encouraged by a catalyst, the hydrogen atom splits into a proton and an electron, which take different paths to the cathode. The proton passes through the electrolyte. The electrons create a separate current that can be utilized before they return to the cathode, to be reunited with the hydrogen and oxygen in a molecule of water. 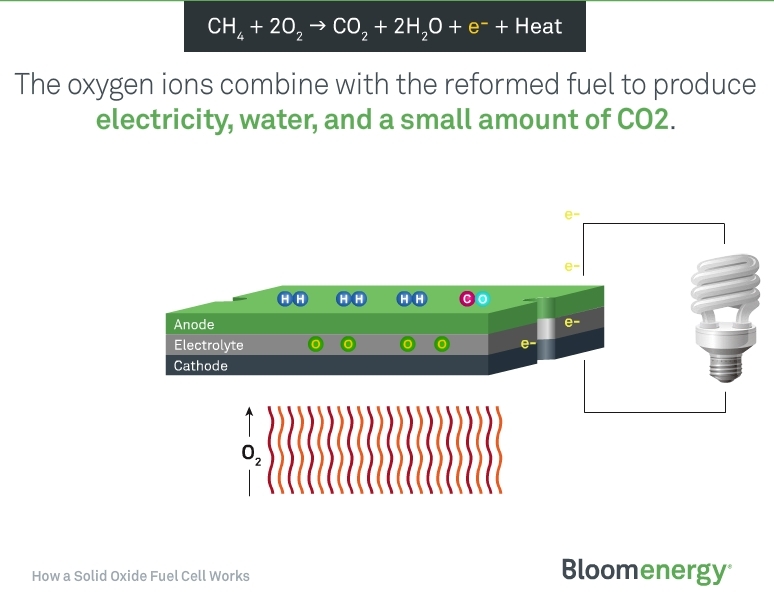 A fuel cell system which includes a “fuel reformer” can utilize the hydrogen from any hydrocarbon fuel – from natural gas to methanol, and even gasoline. Since the fuel cell relies on chemistry and not combustion, emissions from this type of a system would still be much smaller than emissions from the cleanest fuel combustion processes. 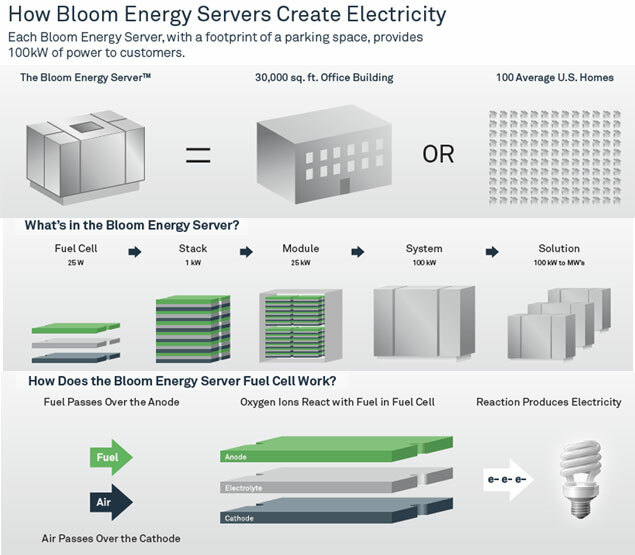 The Bloom Energy Server (commonly referred to as the Bloom Box) is a solid oxide fuel cell (SOFC) made by Bloom Energy, of Sunnyvale, California, that can use a wide variety of inputs (including liquid or gaseous hydrocarbons produced from bio sources) to generate electricity on the site where it will be used. This type of fuel cell can withstand temperatures of up to 1,800 °F (980 °C), which would cause many other types of fuel cells to break down or need maintenance, and is highly advantageous for its smooth operation. According to the company, a single cell (one 100 mm × 100 mm metal alloy plate between two ceramic layers) generates 25 watts. Bloom stated that two hundred servers have been deployed in California for a number of corporations like eBay, Google, Wal-Mart and many more. The Bloom Energy Server uses thin white ceramic plates (100 × 100 mm) which are claimed to be made from “beach sand” . Each ceramic plate is coated with a green nickel oxide-based ink on one side (anode) and another black (probably Lanthanum strontium manganite) ink on the other side (cathode). According to the San Jose Mercury News, “Bloom’s secret technology apparently lies in the proprietary green ink that acts as the anode and the black ink that acts as the cathode…” but in fact these materials are widely known in the field of solid oxide fuel cells (SOFCs). Wired reports that the secret ingredient may be yttria-stabilized zirconia based upon a 2006 patent filing (7,572,530) that was granted to Bloom in 2009; but this material is also one of the most common electrolyte materials in the field. US US20080261099, which is assigned to Bloom Energy Corporation, says that the “electrolyte includes yttria stabilized zirconia and a scandia stabilized zirconia, such as a scandia ceria stabilized zirconia”. ScSZ has a higher conductivity than YSZ at lower temperatures which provides greater efficiency and higher reliability when used as an electrolyte in SOFC applications. Scandia is scandium oxide (Sc3O2) which is a transition metal oxide that is sold between US$1400 to US$2000 per kilogram in 99.9% form. Current annual worldwide production of scandium is less than 2,000 kilograms. Most of the 5,000 kilograms used annually is sourced from limited former Soviet era stockpiles.